Some creative types believe there are only two stories to possibly tell: a stranger comes to town OR a man (or women) goes off on a quest. And that comprises a narrative. Now there are dozens of techniques one could employ when telling that narrative and dozens of more platforms one could use. But when you boil it all down, narrative storytelling is pretty simple. And in reality, if you think about it, it's actually the same story, just depending on the point of view the creator chooses to focus in on. For example, look at Miami. In 2013, we welcomed 14.2 million visitors to our cities and beaches. That's over 14 million strangers coming to town. 14 million men or women going off on a quest. That's 28 million possible stories. And just one reason why Miami is a perfect host city for Filmgate. 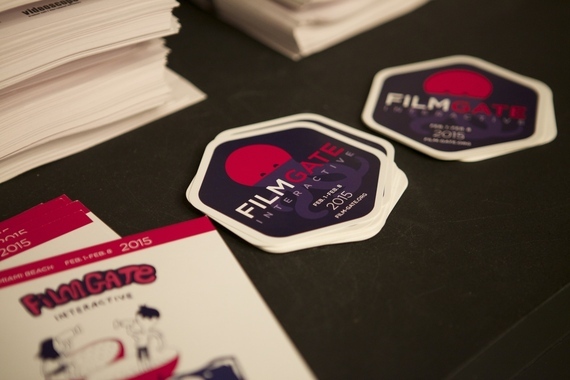 Filmgate is a trans-media festival that just completed its 3rd year in Miami. For layman's, meaning most of us, transmedia is an interdisciplinary means of modern storytelling incorporating a range of methods through a variety of modes. Vague, right? It sort of is, kinda. Think multimedia performance art maybe doused with dance definitely dipped in digital, all revolving around one concept: storytelling. Basically, how can you tell a story in the modern age? And how can you tell that story across as many mediums as possible and digitally. Therefore this modern "narrative" goes beyond just film to include video games, gaming apps, but it also includes more traditional methods of "narrative" like novels, dance, theater and opera. Filmgate celebrated this with a successful festival featuring 25 plus performances in South Beach and Wynwood. To say their modicum of mind exploration and storytelling is 21st century is an understatement. It's tomorrow, today. Therefore today is already tomorrow. The Huffington Post ran a nice interview last year with the director explaining their aesthetics. I was inspired enough by the few events I witnessed. Opportunities to explore innovative ways to tell and produce stories are niche in this city and appreciated. Furthermore, it afforded storytellers a chance to see others pushing the boundaries of technology and narrative technique into the future. It was artsy, but legitimate. I kept thinking Filmgate should merge with the III Points Festival. III Points is an emerging music, art and tech festival based in Wynwood that occurs in October. They are basically aspiring to be the next South by Southwest. III Points has the music part down, and they're getting better with the art, and they have the crowds, but they're sort of lacking with the film and tech. This is probably easier said than done, but if somehow, someone, maybe the Knight Foundation, could bridge together these entities, maybe add another film component, it would really add depth to III Points in the fall. But hey, not all babies can play in the same pen. Either way, Filmgate is already standing on its own two feet just fine.